Riding a motorcycle can be a fun and thrilling experience, but it is also a given fact that there are risks that are involved. For this reason, it is important to be fully-equipped with the gear that you will need, which will not only be vital for your protection, but will also be highly instrumental towards being able to promote your highest level of comfort in every ride. With this, among others, one that you might need would be the best motorcycle goggles. Making the right choice, however, will surely not be an easy thing. There are many options that are available, which will make it difficult for you to make the right choice. With this, keep on reading the rest of this guide and we will provide you with insights on some of the options that are available in the market. We will also have a rundown on some of the models that can be taken into consideration. Protection from Dust and Sand: Even the tiniest particles of dust can be annoying when it gets in your eye. They can cause redness, swelling, and itchiness, among others. It can also affect the way you drive. Fortunately, such can be avoided by wearing motorcycle goggles. Protection From Insects: Stray insects are common when driving. They can hover around your face and can attack you directly in the eye. This can also lead to discomfort, and hence, wearing goggles can be a good thing. Protection from Glare and Heat of the Sun: Driving under the scorching heat of the sun can hurt your eye. This can be solved by having goggles with the right tint, which will not only block UV rays, but will also prevent glare, making it easy to see the road. In your search for the best within the product category, the first thing that you need to do is to determine the specific style of the goggles that you would want to purchase. There is no rule of thumb with regards to which one is the best, but it will all boil down into personal preferences. 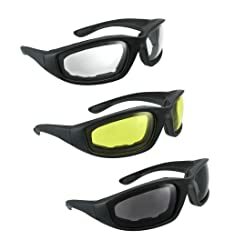 Sunglass Goggles: They will be fitted over the ear and they will have a fit that is similar to conventional eye glasses. They are versatile, but they are more commonly used in biking. They usually have a thick lens. One of their benefits is the simple design and lightweight construction. They also come with a practical price, making it the perfect option for budget-friendly buyers. Wrap-Around Goggles: They will be slipped over your head and they provide a full enclosure. This will provide you with the assurance that it will not fall off, regardless of how fast you are biking. They are padded for your comfort and the lenses are commonly tinted. Convertible Goggles: This is the best when it comes to versatility as it will allow you to enjoy the benefits of the two types that have been mentioned above. It comes with a slip-on strap and can be conveniently converted into a sunglass-type goggle if you prefer one that looks more casual. They also come in a variety of lens types. To make it easier for you to differentiate the alternatives that are available in the market, pay attention to the factors that will be mentioned below. Fit: One of the most important things when it comes to motorcycle goggles would be the right fit. The latter is important because it will be indicative of comfort and effectiveness of the product. If it is too tight, you will most probably end up with discomfort. If it is too loose, on the other hand, it may end up falling off from your face. A good idea is to choose one that can offer customizable fit, allowing you to have it modified depending on what you are most comfortable with. Lenses: There are different types of lenses that are available. It is important to choose the right one because it can aid in the prevention of eyestrain, improvement of contrast, and enhancing reaction time. It should also be made from a high-quality material that can be highly effective in being able to block the harmful rays of the sun. 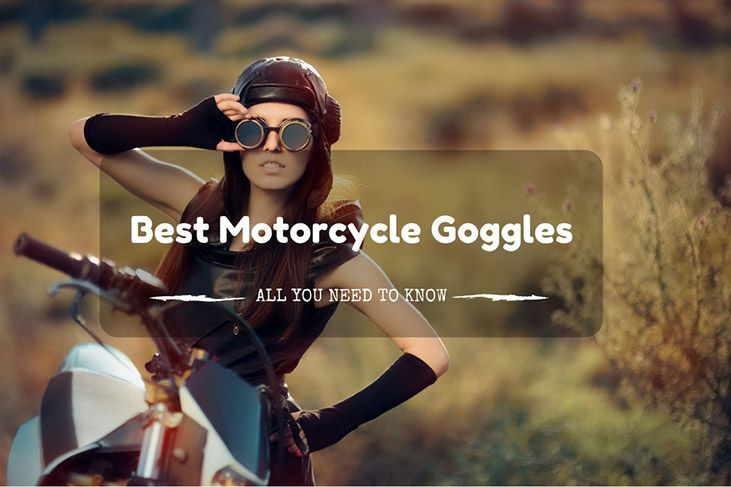 Among others, most people prefer polycarbonate polarized lenses for their motorcycle goggles. It is also important to determine whether you will be needing prescription or non-prescription lenses. 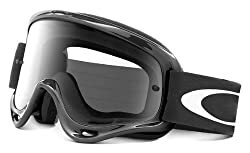 Frame: The design of the frame is important not only because of aesthetics, but also because it will have a huge impact on the functionality of the goggles. In this case, an excellent pick would be frames that wrap around the face. This is going to provide you with the assurance that it will stay in place, even in spite of the strong wind. Maintenance: Obviously, a good choice would be motorcycle goggles that will require minimal maintenance. If it is hard to maintain, you will most probably end up with goggles that won’t be long-lasting. Also, to maintain its quality through time, make sure that it is properly stored and regularly cleaned. If you are looking for an option that can prove to be perfect for budget-conscious buyers, this one should be on the top of your list. It comes with an economical price, making it one of the cheapest in the market. It is even made better by the fact that it already comes in a pair of three. The mirror coating that you can find in this product is one more thing that I loved. Even at its price, it is impressive that it has a good capability to fight glare and block the rays of the sun, which is basically because of the design of its lens. In addition, another thing that I find personally commendable in this model is that it is equipped with a generous amount of foam around the eye. This prevents friction and can be effective in being able to promote your highest level of comfort in every ride. Lastly, it is a good thing that it comes in three different shades. Pick whatever color you would want to wear for the day. Let your mood decide which one should be chosen. Brand name – this is perhaps one of the reasons why this model is one of the most popular within the market. If you are brand conscious and if you want to be sure of the quality of the goggles, this is one that should be on the top of your list. Are you looking for a product that can withstand the test of time? This is an option that you might like. It is equipped with a scratch-resistant Lexan lens, which is sure to withstand many years of use. The silicon strap is also a good thing. It is made from premium materials that are also long-lasting. There will be three choices for lens tints, providing you with the versatility to choose which one is best for your requirements or preferences. You can opt for an iridium coating, which can be effective in glare reduction. One more thing that I love about this model is how it comes with triple-layer face foam. 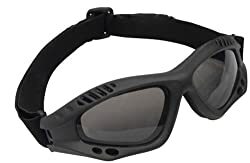 Since this is a wrap-around goggles, the incorporation of foam on the band will make sure that it won’t irritate the skin and will help you to feel comfortable all the time. At first, you might not be interested in buying this motorcycle goggles because of the high price. However, take note that the price is already for three pairs. Yes, three! This means that it can actually be cheaper than many of the alternatives that you can also find on the market today. If you value comfort, you have another good reason to consider buying this model. It has excellent foam padding on the sides, which act as sort of a protection for the face. This can avoid excessive friction, making you feel comfortable throughout the time that it is worn. I also loved how cool they look. They seem to be stylish, yet it is surprising that they can be purchased at a price that is sure to not hurt your wallet. It is a good thing that it can perfectly fit in your face. You can be sure that it will stay in place. However, it is not recommended that you wear it when driving at a high speed. I believe that this can lead to frequent falling off from the face. This is another model that I can highly-recommend for those who are looking for an impressive product that won’t hurt your pockets. At its price point, it is actually quite surprising that it has features that can prove to be exceptional when compared to competing models. Before being released in the market, this motorcycle goggles has been quality-tested. It has undergone stringent tests in order to evaluate its quality and to make sure that it has passed global standards. This can provide you with peace of mind that it can be excellent when it comes to durability. This model offers SP400 UV protection. Even if you are driving under the scorching heat of the sun, you can be confident that it will be able to aid in the prevention of eye damage. The one-inch elastic strap that wraps around the head is one more thing that I commend about the product. It can provide you with the assurance that it will stay in place. There is an adjustment on the back, allowing you to have it loosened or tightened, depending on the size of your head. 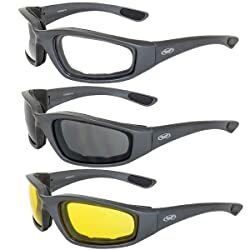 In sum, from the models that have been mentioned above, if there is one that I can personally recommend, it would be Global Vision Kickback Foam Padded Motorcycle Sunglasses Gunmetal 3 Pairs. Value for money is what it can offer, especially because it already comes in three pieces. As your choice for the best motorcycle goggles, you will be happy with the comfort and fit that it can deliver. It also comes with high-quality lenses that can be effective in blocking UV rays and protecting your eyes from external elements.